Then in went the ballon whisk to mix it all. [The sugar will dissolve further with daily shaking of the container.] Now I have to leave the mixture for 10 days or so, after which it has to be strained through muslin and left another 2 days before bottling. According to the results of a recent facebook quiz [in which I have a touchingly childlike faith] this song is the soundtrack of my life! Mix everything except the pineapple together well. [I used a hand mixer, first the dough hooks and then the beaters.] Then add the pineapple and mix with a metal spoon. Line a shallow, oblong baking tin or a baking tray with half-inch borders with baking parchment. [Ortensia says you should dampen the baking parchment but I think it works better if you don't.] Pour the mixture into the tin or tray. Spread it out with a palette knife. Sprinkle the top with powdered cinnamon. Bake in an oven pre-heated to 180 C for 45 minutes. You can put the cake on a cooling tray if you are brave but as it is rather fragile I prefer to do as Ortensia does and cut it into squares on the cooking tray. Serve hot or cold, with a dollop of cream or ice cream if you like. This cake should be made on the same day as serving. But I didn't "buy a fat pig" or a "plum bun" at Modica Sorda's fortnightly market this morning because Rosa and I were in search of clothing bargains. you won't earn much money." Thus goes a Sicilian proverb and indeed, this could have been the motto of the market traders we encountered. Had there been any room in my freezer, I could have stocked it up for a very reasonable price. But so determined was I to get at the clothing that I even walked past a stall full of fridge magnets! There was not a single stall that was not crowded but the biggest throng by far was around one selling what Italian women refer to as "house" dresses - simple, cool, sleeveless, usually patterned dresses, quite pretty in their way, which the women wear in summer when they are cooking or doing housework. They wouldn't be seen dead in these garments outside, partly because everyone would know they were from the market - "vergogna" ["shame"] - and partly because they would not deem them sufficiently elegant attire for walking down the street to deposit their rubbish bags in the communal bins. Now I wouldn't have minded snapping up one of these dresses myself, but I could only find medium, large or extra-large sizes [no small at all], which was quite maddening as when I was a larger lady I couldn't find large sizes for love nor money. I probably was a bit half-hearted about grabbing as many of the dresses as I could in one go and scrutinising them for size, quality and then resistance to tugging by giving them a good yank, [you expect all that for your 6 euros? - yes, siree, in Italy!] which was what all the other women were doing, and I got so hot that I gave up the fight after a mere half an hour, reader. "Li ricchi comu vonnu e li poviri come ponnu" = "The rich live in the way they want and the poor in the way they can." A girl's best friend [after her dog] is her hairdresser and here I am with my lovely Raffaele, having got myself a new colour - well, several, actually - this morning. Raffaele, newer readers may like to know, has been my hairdresser here ever since I was first introduced to him in 1995 and he also functions as my psychologist, counsellor and huggy person. After becoming ill in October, though, I did find it convenient to sometimes go to the new hairdresser's right opposite my apartment. Orazio is a good hairdresser and a kind man, too. But the trouble is, whilst Raffaele knows that I now and then go to Orazio's, Orazio doesn't know that during the week I go to Raffaele's and now I'm going to have to explain the new colour away! My, it's getting complicated, keeping two hairdressers happy! Here, as in the UK, any hairdresser worthy of the name will give you a free comb-out between blow-dries if you are a regular client and once I got muddled and had Orazio combing out Raffaele's "do"! I feel every bit as guilty as an adulterer and as if I'm in a Brian Rix farce! How, dear reader, am I going to walk up and down my own street tomorrow without Orazio noticing the colour? [I can't tell him that I did it or that Rosa did it as any fool could tell it's been done professionally. I'd thought of wearing a sunhat but that would ruin the do.] So it looks as if I'm going to have to come clean but I don't want to do that till I'm in Orazio's salon on Saturday and can explain properly. I shall just tell him I've been Raffaele's client for years and I can't hurt him again by going elsewhere for the colour. Hmmm, but there's still tomorrow and Friday to get through. As for my clobber in the photo, reader, I think I'm regressing, in my old age, to the days of love and peace. I just hope there's some of each of these between hairdressers after tomorrow! As Matthew Fort points out in Sweet Honey, Bitter Lemons, if you ask a Sicilian cook what you should put in a farsumagru, you are likely to get the answer, "tutto quello che vuoi" ["anything you like"]. A typically Sicilian dish, it consists of a long, thin piece of veal, stuffed with hard-boiled eggs and a meat mixture, then rolled and cooked in very little sauce. In Corleone, Fort meets two butcher brothers who use pork instead of veal, though this is unusual. The etymology of the word farsumagru is interesting: many cookery books in both Italian and English state that it is Sicilian dialect for "falsomagro" ["false thin"] which makes little sense unless it is an example of the kind of joke Sicilians love - a dish which you think is a modest one turns out to be fit for a banquet. [There is little in it that could make you fat so I don't think the joke is to do with the "thin" part of the word.] Mary Taylor Simeti, in Sicilian Food, is of the opinion that the word is a corruption of French farce maigre, meaning a meatless stuffing and this seems more likely, with meat being added later when the chefs of the rich refined the dish. As Simeti points out, farsumagru is really a very large involtino. To make farsumagru you need a large, thin piece of veal or beef [about 700 gr]. Butchers here know exactly what to do if you tell them what you are making, but in the UK you may have to pound the meat out yourself. You also need a 200 gr piece of cooked ham in 1 or 2 pieces, or you could use large slices of mortadella. Then you need about a half length of Italian sausage [about 300 gr]. As the sausages sold as "Italian" ones in the UK do not resemble fresh Italian sausages at all, I suggest that you use whatever strongly flavoured sausages you please. You will need to get the sausage meat out of the skin and mince it up a bit in a processor or with a fork. You need about 100 gr lardo [which is bacon, not lard] cut into strips and some extra which you will use for cooking the farsumagru. In the UK I suggest you use some fatty bacon strips and some good old beef dripping from a butcher for the cooking. You also need about 150 gr minced veal or lean minced beef, 4 hard-boiled eggs, ends trimmed off and the rest sliced, 1 beaten egg, 80 gr strong, hard cheese [I used ragusano], cut into strips, 100 gr pecorino piccante, grated [if you can't get piccante, use plain pecorino and add some red pepper seasoning], 1 chopped white onion and 1 chopped garlic clove, 100 gr petits pois, cooked and drained, a handful of chopped parsley, 2 tablespoons homemade tomato sauce or 'strattu [tomato paste] or passata, a glass of red wine and 2 tablesp olive oil for cooking the rolled and stuffed meat. Oh, and a fresh bay leaf if you have one. Now mix the sausage meat, minced veal, grated pecorino, peas and beaten egg together. In a small bowl mix the chopped parsley, onion and garlic together. Now roll the piece of meat up from a short end, then tie it with kitchen string both crosswise and lengthwise. Italian cookbooks say "as if you were tying a sausage", which I have never done, but it's a matter of using your common sense. I was surprised at how neatly the filling stayed in place, as I'd forgotten to ask the butcher for a bit of culinary netting to keep it secure. Right, now put 2 tablesp olive oil and a bit of lardo or dripping into a large pan [I used my wok, to which I am much attached] and put the farsumagru in before you light the flame [otherwise you will get splashed and possibly burned]. Let it colour on all sides. [This means turning it over a couple of times and holding it up in the oil for the ends to colour. Take the pan off the heat to turn it.] Then add the tomato sauce / strattu /passata and wine, season the sauce, add the bay leaf if using and let it cook another 30 minutes or so. You should let the wine evaporate but I like a bit of sauce with mine [which is not the authentic way to serve it] so I didn't quite let it all do so. I've lived in Sicily for almost exactly four years, but - vergogna! [shame on me!] - I've yet to see the Infiorata [carpet of flowers] at Noto. This year I couldn't get there because of work commitments. However, on Saturday morning I thought I'd pay my respects to Noto anyway, and Rosa came with me. Noto Antico or "Old Noto" was destroyed by the devastating earthquake of 1693 and the city now known as Noto was built from scratch a few miles away. Therefore you see a homogeneous Baroque city, with one of the most stunning skylines in Sicily. Me on the Cathedral steps, just to prove I was there! The first time I saw Noto I was disappointed. That was in winter and the city was in obvious decay. In 1986 it was discovered that the whole city was so fragile it was about to fall down! I am happy to say that much work has been done on its monuments since then and today it is as beautiful as ever. WHY I DON'T DIY ! Then I remembered that this sort of thing is likely to happen if I attempt DIY! I nearly threw this school photograph away before moving to Sicily, as I was not happy at that particular school. Why? Partly because it’s hard to fit in when you change schools at 15 and partly because it was an all girls' school! But I have to admit we were well taught there, by women ahead of their time, and I shall be grateful for that till my dying day. Anyway, I’m very glad that I kept it, because it has caused much fascination here, firstly among my Alberghiera class, who couldn’t believe that we really all wore uniforms or that we sat or stood still long enough for the photographer to do his work. Other teachers in the school were also interested and one remarked that it would be impossible to take a photograph like that in Italy, because no one would stand where they were supposed to, be still for a moment or stop chattering to hear the photographer’s instructions! [I did point out that it was 44 years ago and we were a little easier to discipline than kids would be now.] All this inspired me to get the picture framed and I collected it this morning. A roomful of people in the art shop saw it when it was brought out from the workroom and they all shook my hand and congratulated me on having such a fine photo. So there we all are on that summer’s day so long ago, young girls with our lives ahead of us, a generation that had not known war and which took university entry as our birthright. Which one is me? If you’ve seen the photo on my facebook pages, you will know; otherwise I’ll just give you the section - I'm not telling! Many thanks to those of you who have voted in the poll on the right and if you haven’t voted and would like to, please do so. James has responded with a whole post at Nourishing Obscurity and I thank him for taking the trouble to do so and for providing a man’s take on the issue. “Oh, what was that?” I asked as I didn’t have the faintest idea what I might have said. I did, however, recall that my perfume at that time was Charlie, one which, although it has been revamped, I feel too old to wear now. Charlie was the girl about town, who daringly strode to work in a trouser suit. Impeccably groomed, she was the sort of girl who gets her eyeliner on straight first time and you just knew she never made a mistake in her job. The perfume was meant to confirm that she was, nonetheless, entirely feminine. Recently I nearly came to blows with a friend over the matter of perfume. I was both surprised and upset by what this person said, which was, basically, that he liked people's "natural" smell and preferred women to wear no perfume at all. I was surprised because it had never occurred to me that any woman would go out - or stay in, for that matter - without putting perfume on, and upset because I drown myself in YSL Paris every day and it's as much a part of me as my make-up and clothes. I've always regarded perfume as essential and have been proud of wearing a scent that has become my "signature" one. My friend pointed out that some people may not like it, to which my response was that they could stay away from me, then, though I did take his point about allergies. But heavens above, as an asthmatic I suffer from enough allergies myself and I don't think a good perfume can be classed with something positively harmful, like the odour of tobacco smoke. Anyway, I'd be grateful, dear readers, if you would take a minute to do the poll in the sidebar, as I'll be interested to learn what you think. Yes, the Comune has run out of money again, so the refuse collectors have not been paid! The Comune has also once more had all its phones cut off for non-payment of the bills. I therefore deduce that the next time I try to order water for the condominio I will be told that the service is sospeso. All this always seems to happen in summer; a nice welcome for the tourists, don't you think? When I'm not avoiding the stink of piled-up rubbish bags I am attempting to restock my summer wardrobe. Regular readers will remember that, since becoming ill in October, I have lost a lot of weight and have had to chuck most of my clothes out. Even the things I had altered don't fit now. Something like a summer wardrobe is beginning to come together: yesterday I went out to buy a pair of jeans but came back with the kaftan you see on the bed and today I was spurred on by the offer of a beach chair if I spent 80 euros in the same shop, a task which I accomplished with no difficulty! [I'll show you the chair when I figure out how to put it together.] Now I need some shoes to go with this lot! "Look in the mirror before you leave the house - and take one thing off!" That's fine with me as long as that one thing isn't my pefume! Yesterday was the last day of the English course I've been teaching at the Alberghiera [catering college] and here are some of my very lively students [with the course administration tutor in the second photo]. It has truly been a delight to teach this group and I wish them well. Siete bravissimi, ragazzi. dopo i crudeli bellici contrasti. di un arcobaleno di pace. davanti al camino della gioventù. after the cruel war-like quarrels. of a rainbow of peace. beside the hearth of youth. the focus of many-coloured attentions. in the echoing , existential sunset. - From Il Profumo del Pensiero [Edizioni Nuovi Poeti, 2009]. The part about the teenage romance is based on fact; I actually dreamt, very vividly, that the rest happened! On the day of their reunion they strolled around old Bristol hand in hand, laughing like young lovers, a woman approaching her sixtieth birthday and a man two years her senior. It had been she who had suggested they meet in town. She hadn’t wanted to go out to Soundwell, for that was where she had parted from him last. It had happened over forty years ago but she still didn’t trust her emotions. She remembered, as if it were yesterday, crying as the sound of his footsteps faded the night before her family moved to London. He hadn’t written. She was breaking her heart and growing thin and he did not write. Her father was furious and she fought him, making excuses for Paul and saving for the coach fare to Bristol, so that she could find out what was wrong. [We didn’t have mobile phones and texting in those days. Many people didn’t even have a phone in their house and Paul’s family were among these.] Finally, fearing that she might actually run off, her father relented and took her to Bristol to see Paul. Oh, he’d thought his silence would end it, end it for her sake, he’d said. [The intensity of her own letters and the depth of her pining had frightened him.] And then he broke down and cried, right in front of her. Don’t let anyone tell you, reader, that young love is not “real”, that it cannot hurt, for it hurts like nothing can again. After that there were many weekend trips to Bristol and for one glorious, summer week Paul came to stay with Mel and her family. Together they’d explored the sights of London and in Selfridge’s he even bought her a ring. Her father wasn’t pleased and she could not understand why. Hadn’t he married young himself? Didn’t he want her to be happy? Of course he did! He just wanted her to be sure, to go to university like her friends, to give her young life a chance. It wasn’t until years later that he told her he’d seen Paul in Bristol one night when he’d stood her up. He’d seen him with a girl, an older girl who would “go all the way” as we called it then. That was why he didn’t trust him. Two years after Mel’s first trip back to Bristol, Paul called and finished it. Distance, it seemed, was too much for him. Her father got his way and off she went to university, where she studied French and Italian and read de Beauvoir when she wasn’t dating other young men and plenty of them. She didn’t think of Paul again until the summer she broke her leg, when she was in her mid-thirties. It’s amazing how enforced inactivity can make us recall the past. She just wondered about him and that was perfectly natural, she told herself. She didn’t marry but she was not without male company when she wanted it, so several disastrous men entered her life and left it. Meanwhile she had a career and the years went by. Slowly those years became decades, then one day she saw a 55-year-old woman in the mirror and wondered who she was. That was the day she decided to move to Italy, a country which had won her heart three years after the “Paul débâcle”. How, then, did she happen to be with him in Bristol on that October day? By chance she had seen a name which she’d thought might be his son’s on a social networking site. She’d left a message, not quite knowing whether she wanted a reply or not, and the next day she had found Paul. Widowed, now, he had asked, through his son, if they could meet when she next came over and, as it happened, she was scheduled to attend a translators’ conference near Bristol within weeks. So there, incredibly, they were. She was tempted. What woman in her position would not have been tempted? He’d always been protective and he’d look after her. She was sure of that. For she had to admit that she needed to be looked after these days. “Have what they didn’t have then”, though? They could have many things, it was true: a life together, for however long they had left; times they had shared when young could be shared again as memories; love, too, for that had never completely gone away. But they could not turn the clock back. Their lives had taken very different paths and she was probably more different from the girl she had been than he was from his eighteen-year-old self. She could not now imagine herself as a woman who had not read de Beauvoir and questioned her life because of it. She, who had chosen a new life in another country, would have to leave Italy for him; he would not come to her, any more than he would have in that so distant past. And one day she would look at him and resent him for it. He didn’t deserve that. 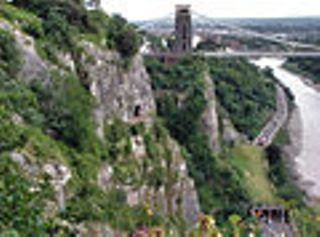 Image of Avon Gorge and Suspension Bridge, Bristol, UK - Wikimedia Commons. The sea at Marina di Modica, Sicily. BACK TO THE "ALTRO POSTO"
"CHE SI FA PER UN MOMENTO DI GLORIA"